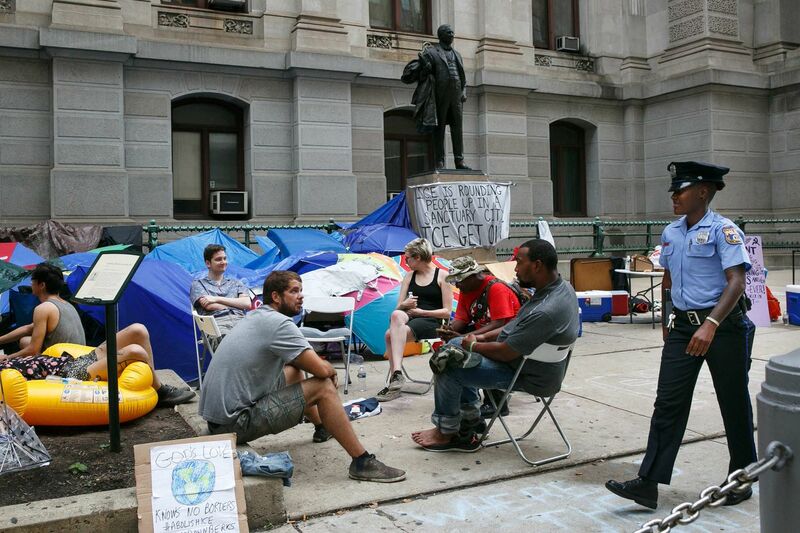 Occupy ICE moved their camp from 8th and Cherry to Philadelphia City Hall on Friday, July 6, 2018. They are calling for the closure of federal detention center in Berks County. A day after Philadelphia police swept away their encampment outside the federal Immigration and Customs Enforcement office in Center City, opponents of the Trump administration's immigration policies set up a new protest camp at City Hall. It was a move to get Mayor Kenney's attention, as the people of "Occupy ICE" grew angrier at the mayor for allowing police to destroy their first camp. Outside City Hall, about two dozen protesters slept in makeshift tents constructed out of beach umbrellas duct-taped to tarps — organizers say police told them no tents were allowed. They plan to occupy this space until their demands are met. In a news conference Friday afternoon, Kenney said the protesters are free to stay at City Hall as long as they want. But they'll have to rough it: Kenney said the city would not permit the use of tents or generators. "They can be out there today protesting," he said. "Signs, bullhorns, 24 hours a day. And we will keep them protected. … But having an Occupy situation like we had at Dilworth Plaza a few years ago became an unsanitary and unhealthy and unsafe environment." Chenjerai Kumanyika speaks to the crowd during the Occupy ICE protest at City Hall on Friday. Kenney also defended Thursday's police raid on the encampment outside the ICE office. Since non-ICE agents work out of the building where ICE is headquartered, civilians were "held captive to a degree," and that was not tenable, he said. Many in the Occupy group thought the raid was unnecessarily aggressive. Kenney said he had asked the Police Advisory Commission to review how the raid was conducted. "It's unpleasant to move people who don't want to be moved," Kenney said. "It's also unpleasant that a police commander gets headbutted by a protester who is being taken into custody. … I saw that on video, too." He continued: "The issue with yesterday's situation was that the actions of the police were recorded but not the warnings that were given prior to the action being taken. But again, we're going to review what happened to see if we can make some improvements to what happened, and hopefully we won't have to deal with this again." How and when the protesters were warned is in dispute. Anlin Wang, a member of the Occupy ICE collective, says they were given only two warnings. An Inquirer and Daily News reporter witnessed police giving protesters instructions about clearing certain areas, and while they were trying to clarify so they could comply, bike police came in from the back and destroyed the camp. Police spokesperson Sekou Kinebrew said Occupy ICE was given "numerous warnings" and opportunities to clear the affected areas before police took action. The protesters' demands remain the same in the new City Hall location — the abolition of ICE, the closure of a federal detention center in Berks County, and an end to a data-sharing agreement with federal agencies, including ICE — but the tactics have changed. Nationally, the Occupy ICE movement, which has reached about a dozen other cities, has focused on impeding the day-to-day operations of the agency by camping outside its headquarters. Now, Philly Occupy ICE's effort is zeroing in on local officials. "This is a living, breathing mass movement, in all its chaos and complexity," read a statement from the Philly Occupy ICE Collective, saying that the group's strategies and leaders would continue to change and that "more actions are likely to be planned in the near future." >> READ MORE: Did Philly police just bike-doze Mayor Kenney's relationship with progressives? The proximity to Kenney's office is intentional. Protesters want to be "face-to-face" with members of City Council and the mayor, whom they fault for Thursday's raid and arrests, said Alex Casper, a 21-year-old who lives in West Philadelphia. In his news conference Friday, Kenney said that while protesting is an important form of expressing your beliefs, "if you really want to do something … make sure everybody votes in the 2018 midterms and goes and volunteers on a campaign so that we can change the government and get rid of ICE. Because I can't do it. If I could, I would." Occupy ICE protesters moved their camp from 8th St. outside ICE offices to Philadelphia City Hall on Friday, July 6, 2018. They are protesting the ICE detention center in Berks Co., PA. The camp, which protesters built in the night and included some materials salvaged from the original camp site, has been dubbed #OccupyCityHall. Protesters Friday were milling around outside, chanting and eating donated food. They wrote messages — to Kenney, they say — in chalk on the sidewalk, including "Good Luck Getting Reelected Bootlicker," and, "If you do nothing, you are the problem." Casper said the protesters want to confront Kenney and Council members, particularly about their plan for PARS, the police database to which ICE has access. Some said they would be willing to retreat if Kenney vowed to end that agreement, which is up for renewal once it expires in August. Kenney said that he is "not necessarily happy with" the PARS agreement and that his administration is conducting a review to determine how ICE is using the database. He said his administration would likely end the agreement if ICE was found to be "misusing" the database by targeting "noncriminal" undocumented immigrants. But, he said, his administration would tread lightly, as it wants to make sure any decision on PARS doesn't interfere with potential future appeals related to the "sanctuary city" court decision made just one month ago. It was a victory for Kenney over Trump, as the judge ruled that Philadelphia did not have to enforce federal immigration laws. Although some protesters said the mayor's announcement showed their demonstration was making a difference, others remained concerned that the city would continue its arrangement with federal officials. "Whether or not they're misusing it isn't the problem," said Hope Beckary, 21, of South Philadelphia. "The agreement itself is the problem." Chalk messages on the pavement where protesters have set up a camp at Philadelphia City Hall. Though the initial Occupy ICE effort was organized by several groups, including the Philly Socialists and the Democratic Socialists of America, many of the protesters at City Hall are not affiliated with a group. The Philly Socialists are less involved with this specific encampment but are still providing support and plan to work with the Occupy ICE collective to fight for their demands, said Enav Emmanuel of the Philly Socialists.